I agree with most of the above posts but have to say my experience of my HD dealer is very negative. I picked up a brand new Street last August. It had a 3 inch scratch on the exhaust pipe - clearly visible, on the day it was handed over to me - so much for the pdi! Alarm bells should have rang then! I took it in for a service and handed over £250 for the privelage. In return I got my bike back with several very bad scratches on the tank - not present when the bike was taken in!! 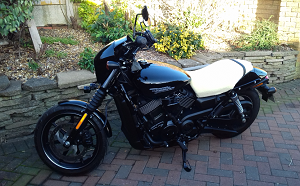 To cut a VERY long story short and after much heated conversation with the dealership and the intervention of Harley UK my tank was eventually repaired and is now again in 100% A1 condition. I do think that my HD dealer, as perhaps a few others do, look on these bikes as a cheap mans HD but I am a 'cheap man' and this is MY Harley Davidson!!! My dealer will never see my bike again.but just in case he visits this site I have attached a photo of it for him! This was my first experience of HD ownership and I regret that my view of the HD dealership in my area, which unfortunately covers a couple of dealers which are the closest to me, is very tainted and I doubt it will change. Have a manual and a set of tools - have dismantled engines before and I can't see this being a great deal different so from now on I will be saving my £250 a year but will sleep easy in my bed knowing that some idiot with a spanner and half a brain cell will not be damaging my bike again!! RUN as fast as you can from that dealer . Educate your self what you are getting in to a why before you get ripped off. That seems a bit steep. The list price for the stage 1 parts runs about $800. The 1K scheduled maintenance shouldn't run much more than $200-$300. That means you've been quoted $400-$500 for the labor of installing the stage 1 components. Most of the work isn't that tough. Swapping the muffler is two bolts and a muffler clamp. I watched videos of it last night. One was literally a guy in his driveway with the big crescent wrench and the little crescent wrench, although a flat bladed screwdriver could be used on the muffler clamp instead. The air cleaner looks to be removing one allen head bolt to get the cover off and swapping the filter. I will say that the installation an flashing of the Screaming Eagle tuner seems overly complex compared to a V&H FP3. It requires some extra cable and a computer. To be honest the video I watched on it seemed to drag things out and the process didn't make that much sense to me. Programming an FP3 and running autotune from my cell phone I can follow. If are in the United States and your bike is model year 2017 or later and still under warranty, the SE tuner is the way to go. Under a consent decree with the Environmental Protection Agency the use of non-Harley tuners will void your engine warranty.